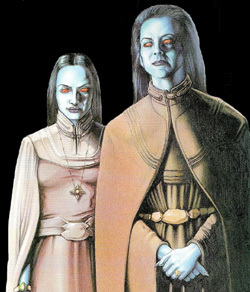 The Chiss are a race of blue-skinned humanoids was from the planet Csilla, in the Unknown Regions. Their homeworld was locked in a planet-wide ice age many millennia ago, and they were forced to flee the planet as a species in order to survive. 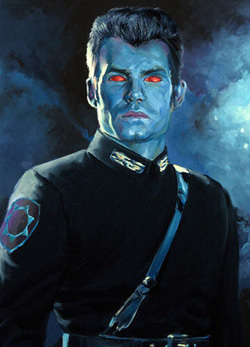 Thrawn, whose real name was Mitth'raw'nuruodo, revealed almost nothing about his species. However, agents of the New Republic, after conducting analyses of surrendered Imperial logs, found a few points of interest. Exhibiting blue skin, jet-black hair, and glowing red eyes, the Chiss generally command attention in a crowd of regular humanoids. Their skin and eye color, it is believed, are due to a chemical reaction they experience in an oxygen atmosphere. While their history has been marked by nearly continual warfare and conquest of other worlds, the Chiss are generally not violent. They prefer to extend themselves only from a defensive posture, and viewed the idea of a pre-emptive strike against an enemy as if it were murder. This unspoken law dated back nearly a millennium before the Battle of Endor, and was one of the strongest points of Chiss honor and morality. The Chiss are an attractive, intelligent, and extremely private species, so protective of their society that they have managed to keep their existence largely secret from the rest of the galaxy. Scientists believe they bypass the adolescent stage of life and advance quickly to full maturity. They are highly evolved, taking great interest in arts and science, and maintain a powerful military. In many accounts, they are described as pensive—contemplative, deliberate, and calculating—studying situations from every viewpoint. They often consider all the alternatives, even what might have occurred if something had been done differently. When attacked, the Chiss fight with calm, intelligent, well-planned strategies. They are an honorable species, however, and in the event of war, they always wait for their opponents to strike first. This is such a moral imperative that they exiled Thrawn when he called for a preemptive strike against an enemy. Despite this rejection, Thrawn was protective of his people, and he never revealed their whereabouts. No other recorded encounters with the Chiss exist, although they are reputed to have driven back the Ssi-ruuk, a military threat considered by manyto be as fearsome as the Nagai and the Yevetha. There have also been reports of a major encounter between the Chiss and the Yuuzhan Vong during the battle at Garqi. Many of the scientists at the Astrographic Survey Institute believed that the Chiss were among the first races to come in contact with the Yuuzhan Vong, some fifty years before their initial invasion. They theorized that the Chiss understood the Vong's military power, and began augmenting their own war machine to prepare to repel an invasion fleet. Unfortunately, the Chiss remained isolated in the Unknown Regions, and wouldn't allow contact with the New Republic after the Battle of Ithor. Chiss sages spent a great deal of time researching the Yuuzhan Vong, and eventually learned that it had taken the alien invaders many generations to cross the gulf between galaxies. One of the most interesting Imperial logs concerning the Chiss was recorded by Palpatine himself, noting his first meeting with Thrawn. The alien Captain Voss Parck brought to me is interesting, not because of his appearance—which reveals the physical limitations of his race—but because of the brain that clearly lies behind those glowing red eyes. This one is constantly thinking, analyzing, strategizing. He showed no fear, but was curious, studying me in turn. He is veil trained. He expressed no anger when I demonstrated my distaste at his presence. I was subtle about it, of course, as subtlety is more likely to insult such an intellect. I was hoping to spur him to anger, and I failed. I am intrigued, to say the least. And I could see that he was as intrigued with me. I could sense that he did recognize me as a threat, but wasn't fearful of harm. He simply studied me as a potential opponent. I am amused. I believe I will watch his new career with interest.